The Pulitzer Prize-winning novelist and Vietnam war refugee reflects on American identity. The following article was originally published in the Financial Times. A protest sign at a rally against Donald Trump in Miami last month. I am a refugee, an American, and a human being, which is important to proclaim, as there are many who think these identities cannot be reconciled. 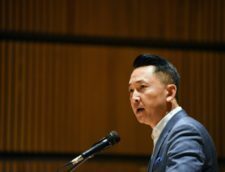 In March 1975, as Saigon was about to fall, or on the brink of liberation, depending on your point of view, my humanity was temporarily put into question as I became a refugee. My family lived in Ban Me Thuot, famous for its coffee and for being the first town overrun by communist invasion. My father was in Saigon on business and my mother had no way to contact him. She took my 10-year-old brother and four-year-old me and we walked 184km to the nearest port in Nha Trang (I admit to possibly being carried). At least it was downhill. At least I was too young, unlike my brother, to remember the dead paratroopers hanging from the trees. I am grateful not to remember the terror and the chaos that must have been involved in finding a boat. We made it to Saigon and reunited with my father, and, a month later, when the communists arrived, repeated the mad scramble for our lives. That summer we arrived in America. I came to understand that in the United States, land of the fabled American dream, it is un-American to be a refugee. 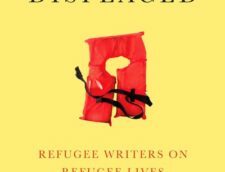 The refugee embodies fear, failure, and flight. 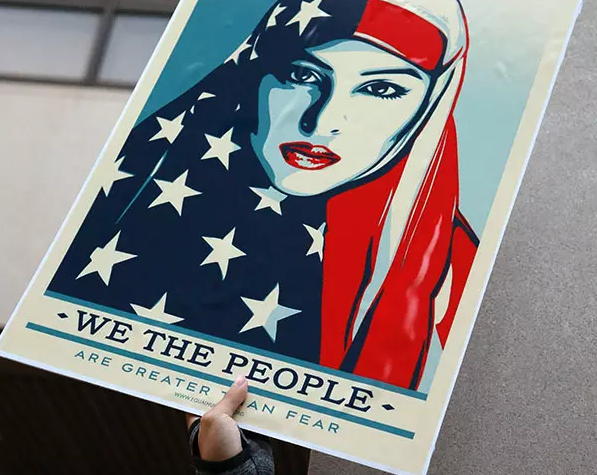 Americans of all kinds believe that it is impossible for an American to become a refugee, although it is possible for refugees to become Americans and in that way be elevated one step closer to heaven. To become a refugee means that one’s country has imploded, taking with it all the things that protect our humanity: a functional government, a mostly non-murderous police force, a reliable drinking water and food supply, an efficient sewage system (do not underestimate how important a sewage system is to your humanity; refugees know that their subhuman status as the waste of nations is confirmed by having to live in their own waste). I was luckier than many refugees, but I still remain scarred by my experience. After I arrived in the refugee camp set up at Fort Indiantown Gap, Pennsylvania, at four years old, I was taken away from my parents and sent to live with a white sponsor family. The theory, I think, was that my parents would have an easier time of working if they didn’t have to worry about me. Or maybe there was no sponsor willing to take all of us. Regardless, being taken away from my family was simply another sign of how my life was no longer in my hands, or those of my parents. My life was in the hands of strangers, and I was fortunate that they were kind, even if to this day I still remember howling as I was taken from my parents. 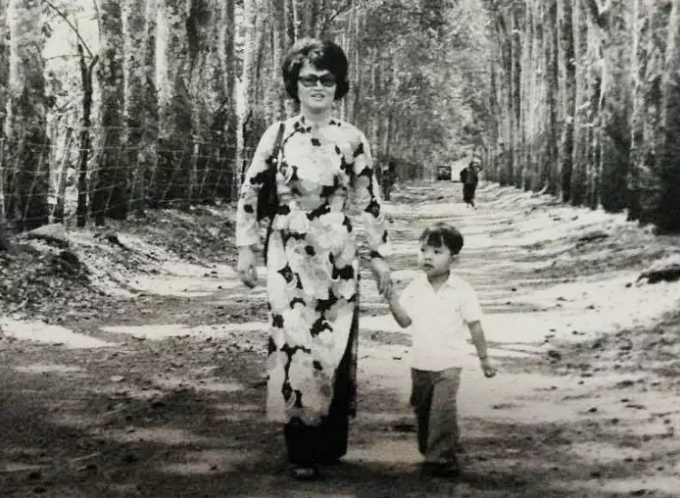 Viet Thanh Nguyen and his mother in Ban Me Thuot in 1973. 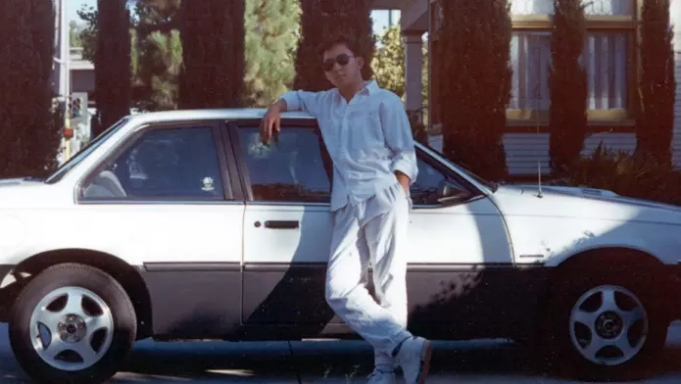 As a teenager in 1987. Like the homeless, refugees are living embodiments of a disturbing possibility: that human privileges are quite fragile, that one’s home, family, and nation are one catastrophe away from being destroyed. As the refugees cluster in camps; as they dare to make a claim on the limited real estate of our conscience — we deny we can be like them and many of us do everything we can to avoid our obligations to them. The better angels of our nature have always told us that morality means opening our doors, helping the helpless, sharing our material wealth. The reasons we come up with to deny doing such things are rationalisations. We have wealth to share with refugees, but we would rather spend it on other things. We are capable of living with foreigners and strangers, but they make us uncomfortable, and we do not want to be uncomfortable. We fear that strangers will kill us, so we keep them out. Our fate as refugees is controlled by the strategies of the men who command the bombers. In my case, the US dropped more bombs on Vietnam, Laos, and Cambodia during the Vietnam war than it did all of Europe during the second world war. This played a role in creating refugees, and because of American guilt and anticommunist feeling, the US government took in 150,000 Vietnamese refugees in 1975. It authorised the admission of several hundred thousand more, and other Southeast Asian refugees, in the subsequent decade. What the US did exceeded what Southeast Asian countries did, which was to deny entry to the “boat people” or contain them in camps until they could find a host country like the United States. Accepting these refugees was proof that the US was paying its debt to its South Vietnamese allies, and the refugees became reminders that life under communism was horrible. We were expected to be grateful for our rescue from such a life, and many of us were and are thankful. 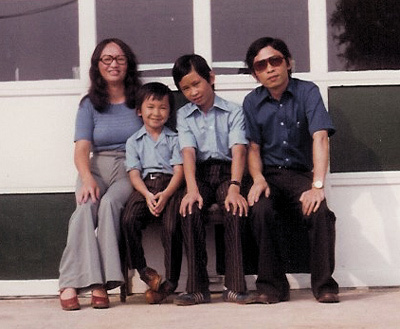 The Nguyen family in 1976. “But I was also one of those unfortunate cases who could not help but wonder whether my need for American charity was due to my having first been the recipient of American aid,” or so I wrote in my novel The Sympathizer. I am a bad refugee, you see, who can’t help but see that my good fortune is a stroke of bureaucratic luck and the racial politics of the United States, where Asians are considered model minorities. If I was Haitian in the 1970s and 1980s, I would not have been admitted as a refugee, because I was black and poor. If I was Central American today, I would not be admitted as a refugee, even though the US has destabilised the region in the past through supporting dictatorial regimes and creating the conditions for the drug economy and drug wars. I am a bad refugee because I insist on seeing the historical reasons that create refugees and the historical reasons for denying refugee status to certain populations. 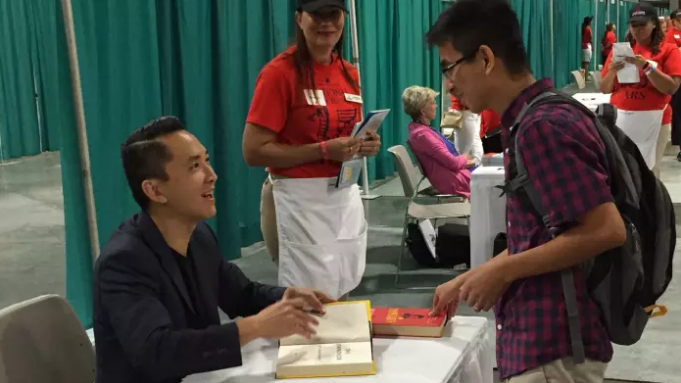 Viet Thanh Nguyen signing a book in Washington, DC. Except that this has not always been true. The current xenophobia in American society that is directed against refugees and their cousins, undocumented immigrants, and even against legal immigrants, has deep roots. Inasmuch as America has been built by immigrants and is welcoming to foreigners, it has also been built on genocide, slavery, and colonialism. These two aspects of America are contradictory but both are true at the same time, as they are true of the other liberal democracies of the west. So it is that in the US, where 51 per cent of billion-dollar start-ups were founded by immigrants, and all of the 2016 Nobel Prize winners are immigrants, the country has periodically turned on its immigrants. Beginning in 1882, the United States banned Chinese immigrants. The excuse was that the Chinese were an economic, moral, sexual, and hygienic threat to white Americans. In retrospect, these reasons seem ridiculous, particularly given how well Chinese Americans have integrated into American society. These reasons should make us aware of how laughable contemporary fears about Muslims are — these fears are as irrational as the racism directed against the Chinese. Various other legal acts effectively ended non-white immigration to the country by 1924, and while the door would slowly creak open with the repeal of the Chinese Exclusion Act in 1943 (when 105 Chinese were permitted to enter annually), the United States would not embrace open immigration until 1965’s Immigration Act. The contemporary US has been defined by that act, with large numbers of Asian and Latino immigrants coming in and reshaping what America is (and for the better; without immigration from non-white countries, American food would be as terrible as that of pre-immigration England). But the prejudice remains. It emerges in the feeling against undocumented immigrants. Those who oppose them say we should give preference to documented immigrants, but I suspect that once the undocumented have been kicked out, these rational people will start speaking about how there are too many immigrants in general. 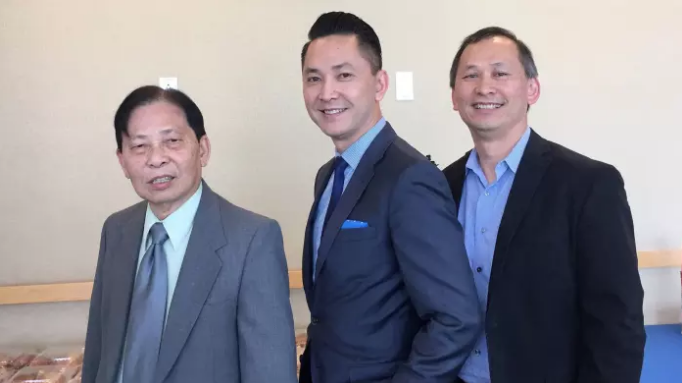 Nguyen (centre) with his brother Tung and father Joseph in 2016. In truth, my own family is an example of the model minority that could be used to rebut such an argument. My parents became respectable merchants. My brother went to Harvard seven years after arriving in the States with no English. I won the Pulitzer Prize. We could be put on a poster touting how refugees make America great. And we do. But it shouldn’t take this kind of success to be welcomed. Even if refugees, undocumented immigrants, and legal immigrants are not all potential billionaires, that is no reason to exclude them. Even if their fate is to be the high-school dropout and the fast-food cashier, so what? That makes them about as human as the average American, and we are not about to deport the average American (are we?). The average American, or European, who feels that refugees or immigrants threaten their jobs does not recognise that the real culprits for their economic plight are the corporate interests and individuals that want to take the profits and are perfectly happy to see the struggling pitted against each other. The economic interests of the unwanted and the fearful middle class are aligned — but so many can’t see that because of how much they fear the different, the refugee, the immigrant. In its most naked form, this is racism. In a more polite form, it takes the shape of defending one’s culture, where one would rather remain economically poor but ethnically pure. This fear is a powerful force, and I admit to being afraid of it. Then I think of my parents, who were younger than me when they lost nearly everything and became refugees. I can’t help but remember how, after we settled in San Jose, California, and my parents opened a Vietnamese grocery store in the rundown downtown, a neighbouring store put a sign up in its window: “Another American driven out of business by the Vietnamese.” But my parents did not give in to fear, even though they must have been afraid. And I think of my son, nearly the age I was when I became a refugee, and while I do not want him to be afraid, I know he will be. What is important is that he have the strength to overcome his fear. And the way to overcome fear is to demand the America that should be, and can be, the America that dreams the best version of itself. 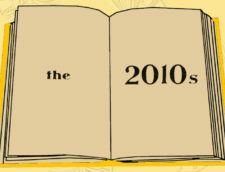 The author won the 2016 Pulitzer Prize for ‘The Sympathizer’. He is the Aerol Arnold Chair of English and professor of American studies and ethnicity at the University of Southern California. His latest book, ‘The Refugees’, is published this month.